There’s just something so primal and satisfying about smoking fish whole. 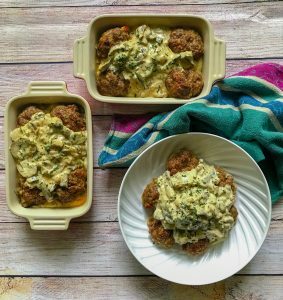 A perfect healthy keto meal that is a show stopper on a plate, or plank in this case. 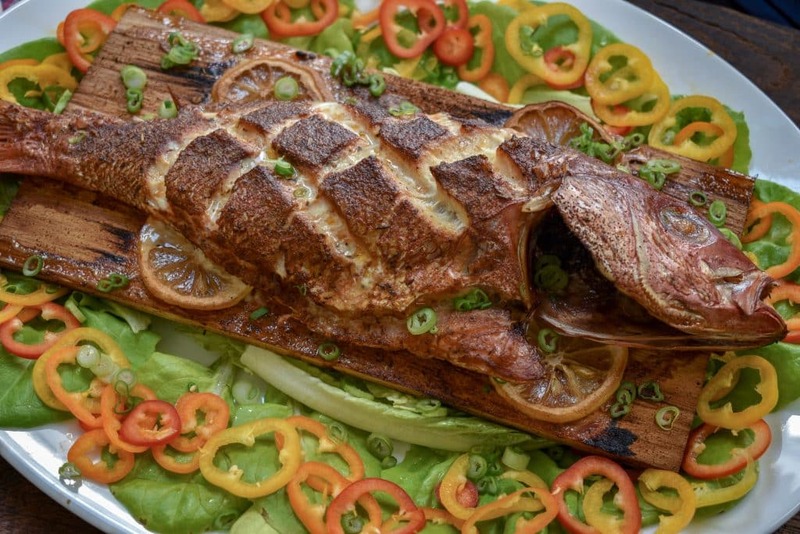 Smoked Red Snapper Is truly a feast for the eyes and taste buds. Getting to know your fish. 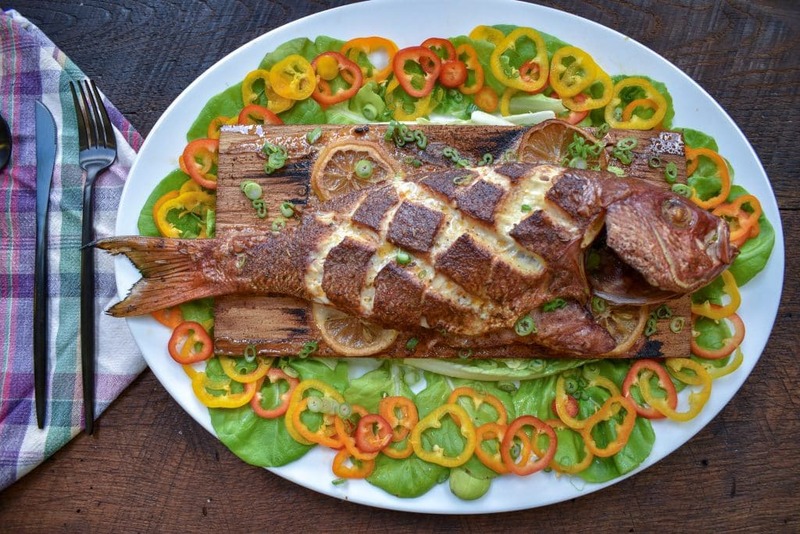 Cooking whole fish can seem intimidating but if you know the basics it doesn’t have to be. 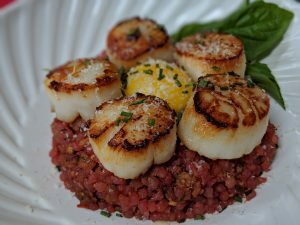 The first step should always be to purchase your fish from a reputable place whether that’s your local grocery store or a fish market. 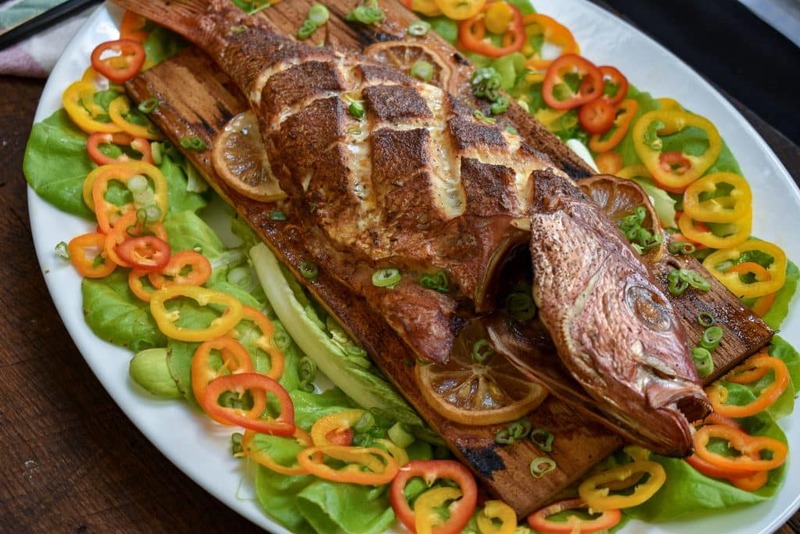 There are a number of whole fish to choose from but far and away Red Snapper is my favorite. It’s a meaty fish that still has a flaky white meat but enough structure that it doesn’t just turn to mush the moment you eat it. You’ll want to first smell the fish and make sure it doesn’t have any strong odor. A bit of a saltwater ocean smell is fine but no strong smell of rotting seafood. That goes for the entire building. If a fish market smells so bad you can barely stand it, it’s probably a good idea to turn around and head somewhere else. The second thing you need to look for when buying whole fish is to look at the eyes. The eyes of the fish should be shiny and glass like. Avoid cloudy or any white milky discharge in the eyes. It’s a dirty job, pay someone else to do it. After you have assessed the quality of the fish and picked a winner. You’ll want to make sure the fish has been gutted and scaled. Most fish should have already been cleaned but there’s no harm in being sure. If for some reason the fish is not scaled I posted a link below on the proper method to scale whole fish but I warn you, it can be a mess and you’ll find scales all over your kitchen for a week. If possible this is best done outstanding on a table that can be hosed off. Now that you have a cleaned and scaled fish you will want to remove any fins. You could probably get your fishmonger to do that as well but it’s pretty easy to cut them off using a pair of kitchen shears. Just pull the fin away from the fish and make a cut where you see it’s attached to the body. Last step before we get into seasoning the fish is to give it a quick rinse under cold water. Just to make sure any rogue scales are hanging around and then pat the fish dry with a few paper towels. Place the fish on a washable plastic cutting board (never use wood for seafood) and make 3-4 cuts in a diagonal direction then 3-4 cuts in the opposite direction so you have created diamonds along the body of the fish.nexts drizzle a bit of olive oil inside and outside the fish and inside the cuts you made on the outside of the body. Then seasoning a the fish inside and out using whatever spices you like. I chose to use the Caribeque Jamaican Jerk Seasoning. It’s perfect balance of the Caribbean jerk flavor your used to but with some hints of a classic bbq rub spice like paprika and chili powder. 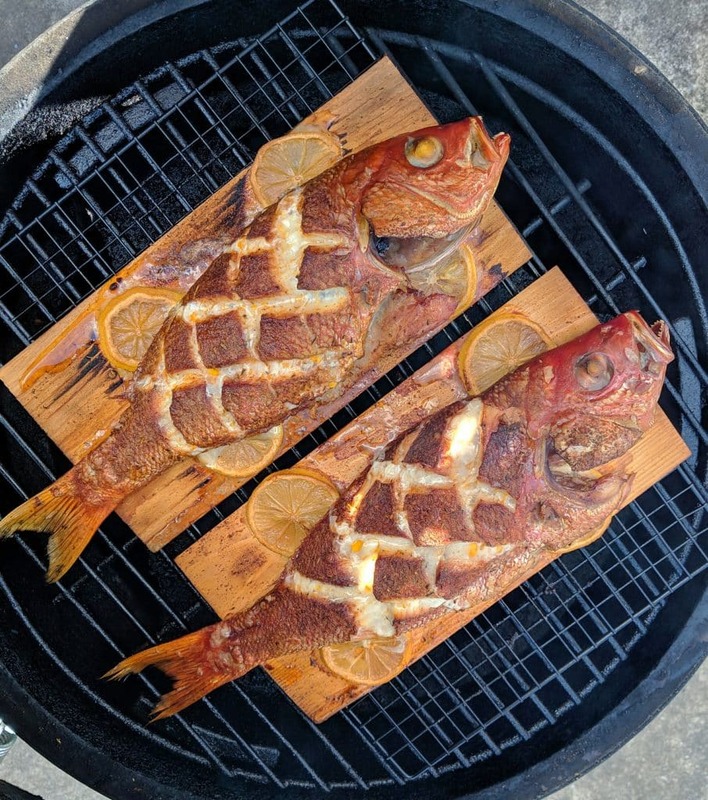 Once the fish is seasoning and ready to go place the fish on a cedar plank that has been soaked in water for at least 1 hour but preferably 3-4 hrs. 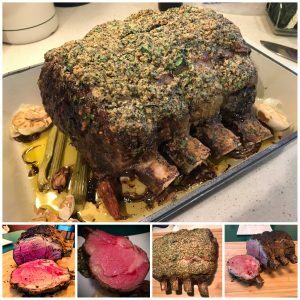 For this recipe I’m using my 22” big green egg ceramic smoker. It’s great because once you get it up to temperature you can maintain it for hours and hours no matter the weather. I maintain a temperature between 375 and 400 degrees F. For about 1 hour. I use a probe thermometer to check for doneness, the fish should be between 150-155 degrees F. If you don’t have a smoker you could use any kettle grill and just build a fire on one side and place your fish opposite the coals so it cooks using indirect heat. I never cook with charcoal briquettes, I prefer to use lump charcoal instead because it burns cleaner and slower. As far as wood I recommend any mild fruit woods or hickory. Really the only would I would avoid is mesquite but I’ll let you decide what type of wood to use. No bones about it…well maybe a few bones about it. Once the fish is cooked it’s time to eat. You can simply start flaking off the tender white meat using a fork but be careful and always keep your eye out for pin bones. No matter how perfectly you cooked the fish you will still have a few bones that sneak by you. Once you have flaked off the meat from the top and exposed the spine of the fish you should be able to pick up the tail of the fish and the bones should all lift up in one motion. Discard the head and bones and begin eating. I STRONGLY DISCOURAGE FEEDING WHOLE FISH TO CHILDREN!!!!! No matter how much diligent you are it seems you always miss a bone or two and those can be very dangerous choking hazards to kids. Make them a hot dog for dinner or buy an extra boneless filet of fish and cook that separately. I love to grill a few lemons and limes cut in half and char them up while the fish is cooking. They’re great for squeezing over the fish and can make a great presentation. 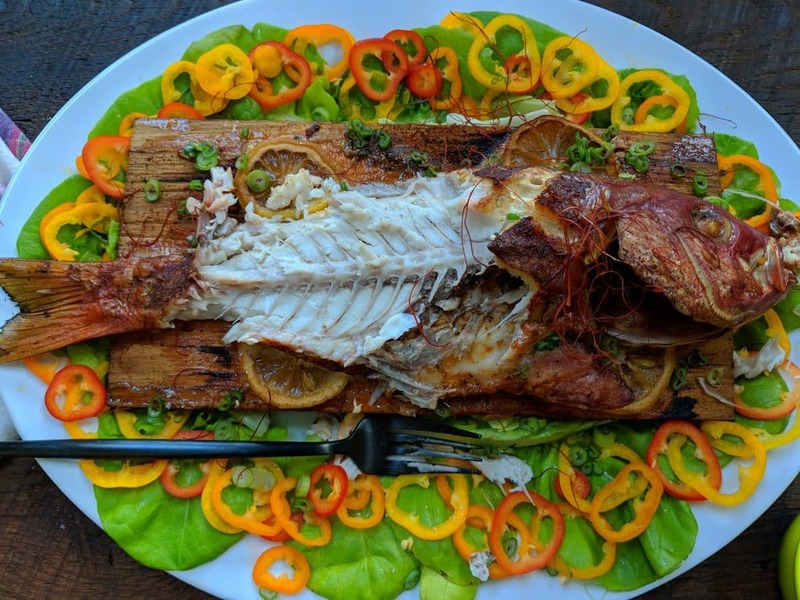 I normally just serve the fish right on the cedar plank with a platter underneath to make things a bit more civilized. Other then that just dive in and enjoy the experience the delicate, fresh, lightly smoked whole fish that you’ve prepared. 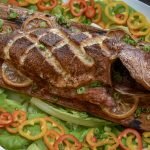 It’s not the quickest or easiest dinner but the texture of fish cooked whole is second to none and completely worth the extra time and effort. Light Smoker and bring up to temp. About 375-400 Degrees F.
After putting cross cut slits into the fish on both sides, rub down with olive oil inside and out. Next season inside and out with jerk seasoning then set on cedar planks that have been soaked for at least 1 hour. Smoke Fish For about 1 hour until fish reaches a temperature of 155-160 degrees F.
Using a fork flake off the top side of the fish until the spine is exposed, pick up the tail and remove the spine along with the head in one pull. squeeze with a lemon or lime and add a pinch of coarse sea salt. LOOK OUT FOR PIN BONES WHEN EATING ANY WHOLE FISH!!!! Nutritional Information is Based on 1 whole fish per serving.